Pumpkin Head lives in his pumpkin patch and collects all things pumpkin. On his patch live pesky crows that interfere with his hobbies. 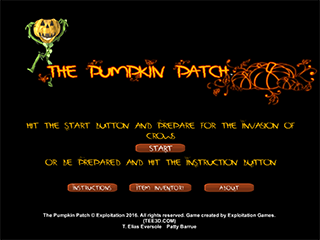 But Pumpkin Head is not so easily dissuaded, as he can spit seeds to rid himself of any enemy. Pumpkin Head loves to search the yards near his patch for anything he can add to his collection. 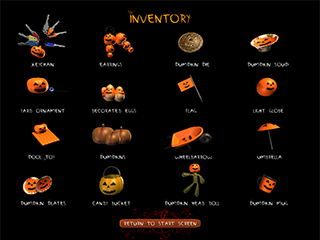 Help Pumpkin Head find his beloved items as you explore the patch. An item collection and adventure game. 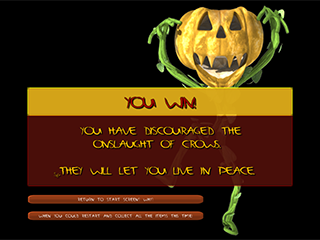 Play "Crow View" or "Pumpkin View" or both. CONTENT NOT SUITABLE FOR YOUNGER AUDIENCES: features crows attacking and seed spitting.